Florence (Italian: Firenze) is the capital of the region of Tuscany in Italy, with a population of about 366,500. The city is a cultural, artistic and architectural gem, and is inscribed on the UNESCO World Heritage list. The birthplace of the Italian Renaissance, Florence was the home to powerful families, creative geniuses and scientific masterminds who left their legacies in the city's many museums and art galleries. The city also has a very rich literary history, being the birthplace of the famous poet Dante, and standard Italian today is primarily based on the dialect of Tuscan spoken in Florence. Politically, economically, and culturally, Florence was the most important city in Europe for around 250 years, from some time before 1300 until the early 1500s. Florentines reinvented money, in the form of the gold florin. This currency was the engine that drove Europe out of the "Dark Ages", a term invented by Petrarch, a Florentine whose family had been exiled to Arezzo. They financed the development of industry all over Europe, from Britain to Bruges, Lyon and Hungary. They financed the English kings during the Hundred Years' War. They financed the papacy, including the construction of the papal palace in Avignon, and the reconstruction of St. Peter's and the Vatican when the papacy returned to Rome from the "Babylonian captivity". Dante, Petrarch, and Boccaccio pioneered the use of the vernacular — the use of a locally spoken language, rather than Latin, and in their case, it was Tuscan, which, because of them, became the standard Italian language. Because Dante, et al., wrote in Tuscan, Geoffrey Chaucer, who spent a lot of time in Northern Italy and who used some of Boccaccio's little stories to inspire his Canterbury Tales, wrote in English. Others started writing in French and Spanish. This was the beginning of the end of Latin as a common language throughout Europe. The Florentines, perhaps most notably Filippo Brunelleschi (1377-1466) and Leon Battista Alberti (1404-1472), invented both Renaissance and neoclassical architecture. These architectural styles revolutionised the way Rome, London, Paris and every other major city in Europe, from Barcelona to St. Petersburg, were built. Florentines were the driving force behind the Age of Discovery. Florentine bankers financed Henry the Navigator and the Portuguese explorers, who pioneered the route around Africa to India and the Far East. It was a map drawn by the Florentine Paulo del Pozzo Toscanelli, a student of Brunelleschi, that Columbus used to sell his "enterprise" to the Spanish monarchs, and which he then used on his first voyage. Mercator's famous "Projection" is a refined version of Toscanelli's map, taking into account the Americas, of which the Florentine was obviously ignorant. The western hemisphere itself is named after a Florentine writer who claimed to be an explorer and mapmaker, Amerigo Vespucci. Galileo and other scientists pioneered the study of optics, ballistics, astronomy, anatomy, and so on. Pico della Mirandola, Leonardo Bruni, Machiavelli, and many others laid the groundwork for our understanding of political science. And there were the Medici, perhaps the most important family that ever lived. The Medicis changed the world more than any other family. Forget all the art for which they paid. They taught first the other Italians, and then the rest of the Europeans, how to conduct statecraft. For example, Catherine de' Medici (1519-1589) married Henry II of France (reigned 1547-1559). After he died, Catherine ruled France as regent for her young sons, and was instrumental in turning France into Europe’s first nation-state. She brought the Renaissance into France, introducing everything from the châteaux of the Loire to the fork. She also was, to 16th and 17th century European royalty, what Queen Victoria was to the 19th and 20th centuries – everybody’s grandmama. Her children included three kings of France, Francis II (ruled 1559-1560), Charles IX (ruled 1560-1574) and Henry III (ruled 1574-1589). Her children-in-law included a fourth king of France, Henry IV (ruled 1589-1610), plus Elizabeth of Hapsburg, Philip II of Spain (of Armada fame), and Mary Queen of Scots. And that is without mentioning any "artists". From Arnolfo and Cimabue to Giotto, Nanni di Banco, and Uccello; through Lorenzo Ghiberti and Donatello and Masaccio and the various della Robbias; through Fra Angelico and Sandro Botticelli and Piero della Francesca, and on to Michelangelo and Leonardo da Vinci, the Florentines dominated the visual arts like nobody before or since. And this list does not include many who, in any other place, would be considered among the greatest of artists, but in Florence must be considered among the near-great: Benvenuto Cellini, Andrea del Sarto, Benozzo Gozzoli, Giorgio Vasari, Domenico Ghirlandaio, Fra Lippo Lippi, Buontalenti, Orcagna, Pollaiuolo, Filippino Lippi, Andrea del Verrocchio, Bronzino, Desiderio da Settignano, Michelozzo, the Rossellis, the Sangallos, Pontormo. And this list does not include the prolific Ignoto. Nor does it include the near-Florentines, such as Raphael, Andrea Pisano, Giambologna, the wonderfully nicknamed Sodoma and so many more, such as Peter-Paul Rubens, all of whom spent time in Florence and were educated by it. The best airport for Florence is usually Pisa International Airport (PSA IATA), just 2 km south of the centre of Pisa. This has extensive connections across Europe and beyond, and most budget airlines fly in there. There are direct buses between the airport and Florence Piazzale Montelungo, which is east side of the main railway station Santa Maria Novella. (On arrival, follow ramp into station to access city centre.) Buses are run by Autostradale (cream buses) and Caronna (black buses) every 75 mins or so till 00:40, taking 70 mins. Single fare €14, you can buy tickets in the baggage hall before exiting through Customs. Alternatively take "Pisamover" tram or airport bus or taxi to Pisa Centrale railway station, which has frequent trains to Florence SMN via Rifredi. Florence's own airport is 43.803211.20031 Amerigo Vespucci International Airport (FLR IATA) (4 km northwest of centre). Known locally as "Peretola", this has only a single runway hemmed in by hills, and limited flights. However it's become a base for Vueling, flying via Barcelona, and direct destinations (some seasonal) include Amsterdam, Frankfurt, London City LCY, Munich, Paris CDG, Rome and Zürich. Reaching city centre takes 15-20 minutes by taxi or bus. From airport by bus: The Volainbus shuttles between airport and SMN main railway station every half an hour from 05:30 to 20:00, then hourly to around midnight. The city bus stop is the ATAF-SITA bus station, west side of the railway station; some early morning / late night buses run from the corner of Valfonda and Piazza Adua north of the railway station. Fare €6 one way, €10 return, buy it on the bus. You can save all of €4 by taking a standard city bus from Via Pratese; it's only 10 minutes walk but involves scuttling across the autostrada A11. Walk out of the terminal, ignore the airport bus stop, and cross the northbound carriageway of A11. Ignore likewise the bus stop midway, which has few services, but choose your moment to dash across the southbound carriageway - there's no crosswalk. Go under the flyover into Via Piantanida, the little residential street directly opposite, and turn right at the other end into Via Pratese. A bus stop, and a newspaper kiosk that sells tickets, are across the street. Tickets are €1.20: if the kiosk is closed just pay the bus driver €2 (and he won't give change). Any bus from that side of the street will drop you near SMN railway station, and they run about every 15 minutes. To return to the airport from central Florence, a cheap easy option is the coach to Prato, which stops right outside the airport. They leave from the 43.776111.25022 CAP bus stop at the end of Via Nazionale near SMN station, round the corner from McDonald's. Look for big blue coaches. Buy your ticket (€1.20) from the CAP office right next to the bus stops. You can do this in advance. Buses run every 15 minutes from 06:00 to 23:00. Ask the driver for "aeroporto" or "Peretola" (the suburb it's in). Taxis charge a €25 flat rate from the airport to anywhere in the historic centre of Florence, plus €1 per large item of luggage. Frequent direct trains connect Florence with Rome (90 mins), Milan (1 hr 40 min), Venice (2 hr), Naples (2 hrs 50 min) and Italy's other main cities. Coming by train from other countries usually involves changing at Milan. However a direct Nightjet runs from Munich leaving around 20:00, reaching Florence around 06:00 and continuing to Rome, with the return leaving Florence towards 22:00 to reach Munich shortly after 08:00. The fare is about €100. This Nightjet divides and also runs to Vienna, with similar times. Almost all trains run from the main station, 43.776511.24783 Firenze Santa Maria Novella on the north edge of the historic old town, near most accommodation and sights. There's a bank of Trenitalia ticket machines (cards or cash accepted) on the terminus platform concourse, staffed kiosks in the main hall, and various fast food options there and nearby. An underpass leads south into Piazza SMN. A few regional trains bypass SMN, calling at Firenze Campo Marte, 2 km east near Florence Stadium, Firenze Statuto 1 km north of SMN, and Firenze Rifredi, 2 km north of SMN. Unless your ticket specifies otherwise, it's valid for any connecting train between those stations and SMN - you'll seldom have to wait longer than ten minutes. Otherwise take a bus or taxi from the street outside. Florence is well connected by good highways to the rest of Italy. Autostrada A-1 runs to Bologna, Milan and the North, and to Rome and the South. Use Firenze-Impruneta exit for these routes and for Siena via the "Fi-Si" highway. A-11 runs to Pisa and the West: for north of the river follow A-11 to the end, for south of the river turn onto A-1 south to Firenze-Scandicci exit. Driving in the historic centre - inside the wide "viale" where the old city walls were (and still are, south of the river) - is strictly prohibited, except for residents with permits. This is ferociously enforced by camera - if you drive in the prohibited areas, you will be hunted down and sent a stiff fine - around €100 for every camera you pass before escaping the zone. The city raises over €50 million in traffic fines each year, half of this from traffic zone offences. If you're just visiting for the day, use the Park & Ride areas at the edge of town, for instance Villa Constanza (described below under "By bus"). You can't leave your car overnight here. If you're driving to pre-booked accommodation in the centre, check ahead with them: given your car registration (Italian targa) they may be able to get you a 30-minute waiver, barely enough to find the hotel in the warren of old streets, drop luggage and check in, then take the car out of the zone. Central car rental offices likewise have a waiver and permitted route to exit and re-enter the city. Firenze Parking run a dozen or so edge-of-centre parking lots, with a long walk or a short bus ride to the centre. For example the lot just north of Piazza della Liberta charges €10 per day, €70 per week. Near the centre, parking is more expensive: e.g. a garage costs €30 per night. On the street, you can only use a blue parking space, if you're lucky enough to find one free. White parking places are for residents only and yellow ones are reserved. The price is €1 per hour and charges apply from 08:00 to 20:00; leave the ticket visible inside the car. You need coins for parking, as the machine won't accept banknotes or cards. Flixbus ply direct between Florence and Rome (3 hr 30, two per hour), Milan (4 hours, roughly hourly), (4 hours, every 2-3 hours), Naples (7 hours, every 2-3 hours), Geneva (12 hours, one overnight, else change in Milan), Marseille (9 hours overnight), Paris (17 hours), Munich (4 per day, 9 hours), Zurich (9 hours), Frankfurt (14 hours), Vienna (12 hours) and Budapest (14 hours). Buses that originate or terminate in Florence run from the downtown bus station on Piazzale Montelungo next to SMN railway station. Buses that are passing Florence between other cities pick up and drop off at 43.75511.1734 Villa Constanza Park & Ride, just off Autostrada A-1 on the west edge of the city - take Tram 1. (And see "Get around: By tram" for practicalities.) The parking lot is short of shelter or other facilities. The Firenzecard is a 72-hour pass giving access to some 80 museums, costing €85 per person (see "See"). It doesn't cover public transport, but you can add this with a Firenzecard+ for an extra €7 - this can't be bought separately. It covers you and any other family member under 18 travelling with you. Since the average entrance fee is €8.50, you'll need to see more than ten museums in your 72 hours to show a saving, but that target dwindles if you have other young family with you. It also gets you priority entrance; pre-booking is otherwise near-essential for the big name museums. Taxis are available, but it may be best if you have your hotel or the restaurant you are eating at call ahead. Taxis should be called by phone and the nearest one available is sent to you through the company's radio system with its meter ticking away. In Florence, it can be difficult to hail a cab from the street curb. You either call for one or get one at the very few taxi stands. One popular taxi stand is at the central Santa Maria Novella Train Station and in a few major squares. The first taxi in the taxi stand line should be free - ask in case of doubt. Most taxis do not take credit card for payment. Be sure to have cash and ask in advance in case you only have a credit card with you. Taxis in Florence are relatively expensive. Tipping is not expected, unless the driver helps you carry luggage etc. Another way of getting around is by using the public buses from ATAF. A day ticket costs €5 and a 3-day ticket costs €12. A four-ride ticket costs €4.70. To get the best price you may have to go to the central bus station. You can buy tickets at tabacchi (shops selling tobacco, which are marked with official looking "T"s out front"), kiosks/newsagents/bars where the symbol "Biglietti ATAF" is shown, as well as at the ATAF ticketing office at the bus station outside Santa Maria Novella train station. A single ticket costs €1.20. Remember to ask for a bus map. Several ticket options are available. One very convenient is the 4-rides ticket and the "Carta Agile". The former needs to be stamped when entering the bus (from the front and rear doors of buses - the central door is supposed to be exit only; though now it is more accepted to enter from the central door). The latter has an embedded electronic chip and needs to be held close ("swiped") to the upper part of the ticket machine inside the bus: the "beep" of the machine will inform you that a ticket has been paid and the display will show you how many more tickets ("swipes") you have left. If you are unable to find a ticket vendor, the automated parking kiosks will sell one for €1.20 and accept credit cards and coins. A ticket may also be available from the driver at €2.00 but there are no availability guarantees. Within 90 minutes of stamping/swiping you can hop-off & hop-on on any bus of the urban ATAF network. Unfortunately and completely against Italian law, it is not uncommon to see bus drivers talking merrily on their mobile phone while driving. Don't expect riders to complain about it and don't panic - they will still drive with the same non-comfortable style as when they are "only driving". Hold tight to hand rails as Florence traffic is unpredictable and frequent sudden braking is necessary. Bus rides are not by all means "smooth". Buses are "safe" but pick pocketing is quite common. Please keep a close eye to your belongings and avoid showing off cash, jewelry, etc. especially in very crowded buses (especially for lines 17/23/14/22 - generally speaking any crowded bus can give a chance to pick pocket). There are two tram lines in the city. The first one runs from Villa Constanza Park & Ride on the south-western edge of the city, just off the A-1, so most users are commuters. It runs into town through the western burbs of Scandicci and L'Isolotto to SMN main railway station (25 mins), then turns north to Rifredi and the University / Hospital area. It runs daily 05:00-00:30 every three to ten minutes, and a single ride costs €1.50. The second, recently opened (as of 2019) line connects the airport and the near west side to the city centre and the Santa Maria Novella station. Don't even think of it - see "Get in". Just thinking of it is probably enough to incur a fine. "I’m pooped, and I’ll scream if I have to look at any more putti or martyred flesh": the fancy name for this condition is Stendahl Syndrome. Stendahl was the pen-name of the French writer Marie-Henri Beyle (1783-1842) – or at least his best-known name, as he generated pseudonyms on an industrial scale. As French Consul based in Milan, he had ample time (perhaps too much time) to soak up the artistic beauties of Italy, and in Florence he found them overwhelming: "As I emerged from the porch of Santa Croce, I was seized with a fierce palpitation of the heart . . . the well-spring of life was dried up within me, and I walked in constant fear of falling to the ground." He was much given to histrionics and attacks of the vapours, and in 1979 local psychiatrist Dr. Magherini named this syndrome, claiming to see many examples among first-time visitors to Florence. c) When you return late to work, the response of your workmates and of your boss is likely to outdo Stendahl in theatricality, and your fear of falling to the ground will be amply justified. So if you feel the well-spring of life drying up in you, head into a bar or café, bang down an espresso, and skip whatever museum or church you planned to see next. Simple. Consider whether you'll benefit from buying a Firenzecard, described earlier, but learn from Stendahl and don't try to see too much. Most tourists rush to do the Uffizi, the Duomo and the Bargello. These are indeed splendid, but you may wait hours to get in, and be jostled by tour groups. Pre-book if you know you want to see them; otherwise spread out and see stuff that is equally fine but less touristy. A long weekend here could comfortably take in a sprinkling of old churches, and a couple of museums or galleries. But leave time and energy for just enjoying the ambience. Churches: the standout is definitely the Duomo or Cathedral of Santa Maria del Fiore. But other fine churches north of the river include San Lorenzo, Santa Maria Novella, Santa Trinita, Santa Croce, Santo Spirito, SS Annunziata and Ognissanti. Highlights south of the river are Santa Maria del Carmine and San Miniato al Monte. Art galleries: aim to do at least one of Uffizi, Pitti Palace, Accademia, Bargello and the Museum of the Works of the Duomo. They are filled with the brilliant creations of all the renaissance big names: Donatello, Verrochio, Desiderio da Settignano, and Michelangelo. There's also a leavening of modern galleries. City views: the classic panorama is from Piazzale Michelangelo, on the hillside just south of the river, and from San Miniato al Monte a little higher up. But every tour bus pauses here for photos so it can get mobbed. Down on the riverside, perhaps the best view is from the south bank late afternoon, as Ponte Vecchio and the Centro Storico become bathed in honey-coloured light. There's also a great view from the dome of the Cathedral or Giotto's Bell Tower, and an even greater line to climb them. Florence is featured in Assassin's Creed II; see Assassin's Creed Tour. 43.77323211.2559921 Santa Maria del Fiore (Duomo) (Enter by right hand door in west facade; disabled access on south flank). M-Sa 10:00-16:30, Su 13:30-16:45. The cathedral interior is to a basilica pattern; it's vast and at first feels dark and empty. Give your eyes time to adjust, and admire the stain glass windows, funeral monument of Bishop d'Orso, and altar of St Zanobius. Below is the Crypt (M-Sa 10:00-17:00) with remains of the preceding cathedral of Santa Reparata, and the tomb of Brunelleschi. Giotto is believed to lie here somewhere, but his tomb has yet to be identified. Above is the soaring cupola or Dome. The cathedral itself is free, but you need a pre-booked ticket and time slot to climb the 464 steps up to the Dome (entrance north side of the church). Slots are available M-F 08:30-19:00, Sa 08:30-17:00 and Su 13:00-16:00. 43.77277222222211.2557861111112 Giotto's Tower (Campanile di Giotto). Daily 08:15-19:00. Almost 85 m tall, with 414 steps to climb, this richly decorated tower is topped by an open terrace with a panorama of the Duomo, city and surrounds. By ticket. 43.77319722222211.2551944444443 Baptistery. M-F 08:15-10:15 & 11:15-19:30, Sa 08:15-18:30, Su 08:15-13:30. Octagonal plan, with a pyramidal roof covering its dome. It's famous for its bronze doors by Andrea Pisano (14th C) and Lorenzo Ghiberti (15th C) and a beautiful interior vault decorated with 13th C mosaics. By ticket. 43.773061111111.25810555564 Museo dell'Opera del Duomo (Museum of the Works of the Duomo), Piazza del Duomo 9 (Directly behind the dome end of the cathedral). F-W 09:00-19:00, Th 09:00-17:00. This houses original artworks from the Duomo and surrounding religious buildings, including sculptures by Donatello, a Michelangelo Pietà (different from his version in Saint Peter's, Rome) and the losing entries in the 1401 contest to design the doors of the Baptistery. Plus models and drawings of the Cathedral. By ticket. - Just wait in line. On a good day this could mean a 4-5 hour wait, hopefully in good weather. On a bad day you wait 4-5 hours outside in bad weather then they sell out and turn you away. This is especially likely on the first Sunday of the month when entry is free. Tuesday too is crowded, since it's closed Monday so there's pent-up demand. - Go on an organised tour - these have a pre-booked slot and you step right in. Caveat emptor, as tour operations range from the shambolic and rushed to the sublime and educating. - By a Firenzecard, so you skip the usual line. Upmarket hotels sometimes also have access to priority slots. - Book online, paying €4 extra and pre-printing your email for a fixed time slot. Be there at least an hour ahead, because so many people are skipping line, there's a line to skip line. - Book by phone on +39 055 294883, likewise paying €4 extra for a fixed slot and arriving an hour early. It's not clear how long you'll typically wait to get through by phone. 43.76843911.25595 Galleria degli Uffizi, Piazzale degli Uffizi, ☎ +39 055 294883. Tu-Su 08:15-18:50, M closed, last admission 18:00; you may not bring in water. Outstanding fine art museum with Renaissance paintings and sculptures from classical antiquity. It's in a late 16th C palazzo designed by Vasari, in two wings enclosing a long narrow courtyard, effectively a street, an innovation in its day. Originally the palazzo was magistrates' offices (hence "Uffizi") and state archives; then it came to house the Medici's vast art collection. The artworks are on the first and second floors, they keep the lifts well hidden. Highlights include Birth of Venus by Boticelli, Dukes of Urbino by della Francesca, Medusa by Caravaggio, Venus of Urbino by Titian, Annunciation by da Vinci, Pope Leo X and family by Raphael, Velasquez' self-portrait, Rembrandt's final self-portrait, and many other big names. Allow three hours for a visit. Uffizi majors on Renaissance, so although later styles are represented they're few: you don't really come here for the 18th - 20th C material. The restaurant/cafè has a large balcony overlooking the main piazza with good views of the Palazzo Vecchio, and naturally their prices reflect the views. Mar-Oct adult €20, conc €10, combi with Pitti & Boboli €38; Nov-Feb adult €12, conc €6, combi €18; booking fee €4. 43.770411.258016 Bargello (Museo Nazionale del Bargello), Via de Proconsolo 4, ☎ +39 055 294883. Daily Apr-Oct 08:15-17:00, Nov-Feb 08:15-14:00, but closed 2nd & 4th Su and 1st, 3rd & 5th M of each month. Used as a barracks and prison until the 19th C, this museum houses some of the best Renaissance and Mannerist sculpture. Big names here include Michelangelo, Donatello, Ammannati, Bandinelli, Andrea and Jacopo Sansovino, Desiderio da Settignano, Giambologna, and Antonio Rossellino. It also displays ceramics, textiles & tapestries, ivory, silver, armour and coins. Allow two hours. Adult €8, conc €4, booking fee €3. 43.7769111.258487 Galleria dell'Accademia (Accademia Gallery), Via Ricasoli 58-60. Tu-Su 08:15-18:50. Highlights are Michelangelo's original David (the one in Piazza della Signoria is a copy) and his unfinished Slaves. It also includes Florentine painting, a museum of musical instruments, and Russian icons. No photography is allowed inside. The Accademia di Belle Arti next door is a university department not connected with the Gallery. Adult €8, conc €4, booking fee €4. 43.76511.258 Palazzo Pitti (Pitti Palace), Piazza de' Pitti (200 m south of Ponte Vecchio). Tu-Su 08:15-18:50, last admission 18:00. The original Pitti was a banker; the palace has housed royalty but became best known for its Medici family treasures. It's nowadays divided into four museums (same ticket): ground floor is the Treasury of the Grand Dukes; first floor houses the Palatine Gallery and the Royal and Imperial Apartments, second floor is the Modern Art Gallery and the Museum of Costume and Fashion. The Boboli gardens are just behind the palazzo. Mar-Oct adult €16, conc €8, combi with Uffizi & Boboli €38; Nov-Feb adult €10, conc €5, combi €18; booking fee €4..
Palazzo Davanzati is a house museum with antique fittings and furniture. It's on Via Porta Rossa and open M-F 08:15-13:15, Sa 13:15-18:30. 43.76775611.2559569 Museo Galileo, Piazza dei Giudici 1, ☎ +39 055 265 311. W-M 09:30-18:00, Tu 09:30-13:00. This museum shows the evolution of the instruments used in various scientific fields such as mathematics, physics, biology, chemistry, astronomy. The room of Galileo Galilei shows some of his original instruments as well as models from his drawings. The room of Spheres and Globes houses an excellent cartographic collection. In a rather macabre twist the museum also has the middle finger of Galileo's right hand on display. €9. Museo Horne displays art and furnishings of the 14th & 15th C. It's in the Palazzo Corsi on Via dei Benci: the building and art collection were owned by art historian Herbert Percy Horne. Open Th-Tu 10:00-14:00. The Archaeological Museum is at Piazza della Santissima Annunziata 9B. The Etruscan art collection is particularly good. Museo Marini houses the work of that contemporary sculptor. It's on Piazza di San Pancrazio, but is closed for renovation. A Contemporary Art gallery is sited in Palazzo Strozzi, and there are several other collections around city centre. The Stibbert Museum is a great collection of armour and arms. It's on Montughi hill 2 km north of city centre, and open M-W 10:00-14:00, F-Su 10:00-18:00. 43.76931511.25617410 Palazzo Vecchio. Old city palace/city hall, adorned with fine art. The replica of Michelangelo's "David" is placed outside the main door in the original location of the statue, which is a symbol of the Comune of Florence. The site displays an important collection of Renaissance sculptures and paintings, including the Putto by Verrochio and the series of murals by Giorgio Vasari at the Salone dei Cinquecento (Hall of the Five Hundreds) - the hall which used to display the now lost Renaissance masterpiece, that is, the so-called Battaglia di Anghiari, by Leonardo da Vinci. "Museum" or "Tower and Battlements": €10 adults, €8 concessions. "Museum" and "Tower and Battlements": €14 adults, €12 concessions. Piazza della Signoria is the grand open space in front: not quite a square, as Palazzo Vecchio blocks out one corner. Sights here are the equestrian statue of Cosimo de Medici, the Fountain of Neptune, the statue of David, and Loggia dei Lanzi, an open arched gallery of Renaissance sculpture. 43.76798911.25319211 Ponte Vecchio. The oldest and most celebrated bridge over the Arno, and the only Florentine bridge to survive World War II. The design is distinctive: it's a three-arched bridge supporting a parade of shops supporting another bridge. It dates to 1345 (hence Ponte Vecchio, "old bridge"), with earlier bridges being swept away by floods, rebuilt and swept away again. At street level it's a pedestrianised cobbled arch. It's lined by shops, which were butchers until Renaissance times then - in an insight as dramatic as the discovery of perspective in painting - they realised that goldsmiths shops paid higher rents and didn't stink; so from then to this day it's just been overpriced jewellery shops and market stalls. Above these is the higher bridge, the Vasari Corridor, a private walkway added in 1565 so that the Medici Dukes could move between Palazzo Vecchio (Town Hall) and Palazzo Pitti (their blingy residence) without mixing with common folk. On the south bank, the Corridor nowadays continues as a gallery of the Uffizi, and there is sometimes talk of extending this over the bridge, or otherwise making the space accessible. Nothing's come of this so far, so the common folk will have to continue admiring the scene from street level. Free. 43.76838911.26283312 Santa Croce. Contains the monumental tombs of Galileo, Michelangelo, Machiavelli, Dante, Rossini, and many other notables in addition to artistic decorations. There is also great artwork in the church. Museo dell'Opera di Santa Croce (included in ticket) displays a flood-damaged but still beautiful Crucifix by Cimabue (Giotto's teacher), which has become a symbol of the disastrous floods of 1966. 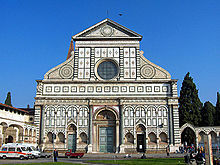 Ticket also includes Pazzi Chapel, a perfectly symmetrical example of sublime neo-Classic Renaissance architecture. Adult 8€, concs 6€. 43.774611.249313 Santa Maria Novella (near the train station). A beautiful church with great artwork, including a restored Trinity by Masaccio. Also, the Chiostro Verde, to your left when facing the front entrance of the church, contains frescoes by Paolo Uccello which are quite unusual in style and well worth seeing, if the separate entrance is open. Off of the church's cloister is the wonderful Spanish Chapel which is covered in early Renaissance frescoes. €5 adults, €3.50 concessions. 43.77075811.25516914 Orsanmichele. A beautiful old church from the 14th century, which once functioned as a grain market. 43.77488911.25386415 San Lorenzo. The façade of this church was never completed, giving it a striking, rustic appearance. Inside the church is pure Renaissance neo-classical splendor. If you go around the back of the church, there is a separate entrance to the Medici chapels. Be sure to check out the stunning burial chapel of the princes and the sacristy down the corridor. The small sacristy is blessed with the presence of nine Michelangelo sculptures. 43.77819811.25932916 San Marco Convent. Houses frescoes by Fra Angelico and his workshop. Fra Angelico painted a series of frescoes for the cells in which the Dominican monks lived. 43.77281911.26662517 Great Synagogue and Jewish Museum of Florence (Sinagoga e Museo Ebraico Firenze), via Farini, 6, ☎ +39 055 234 6654. June-Sept: Su-Th 10:00 - 18:30, F 10:00 - 17:00; Oct-May: Su-Th 10:00 - 17:30; F 10:00-15:00. Closed except for religious services on Saturdays and Jewish holidays. Lovely Moorish-style synagogue built in 1882 and a museum with many artefacts and documentation of Florentine Jewish life going back many centuries; visits are guided. €6.50 total for the synagogue and museum. The English Cemetery in the 19th C received anyone that the city's churchyards wouldn't receive, eg Orthodox Christians, but British & Americans were the majority. Famous names here include Elizabeth Barrett Browning, Fanny Trollope, and Beatrice Shakespeare a relative of William. There are lots of ornate gravestones with flowery inscriptions in multiple languages. It's on the ring-road 1 km east of the centre near Campo di Marte railway station. 43.76683311.25263618 Santa Felicita (just south of Ponte Vecchio). Contains frescoes of the Annunciation and a painting of the Deposition of Christ by the brilliant and weird mannerist painter, Pontormo. They are to be found in the Barbadori Chapel, which is to your immediate right when entering the church. Pitti Palace: see Museum listing above. 43.7625411.24819819 Boboli Gardens. Elaborately landscaped and with many interesting sculptures, behind the Pitti Palace. Wonderful city views. Don't miss the Bardini gardens. Entrance to that is included in the combination ticket price for the Boboli, and it's a short walk from the Boboli Gardens. There are great views of the Duomo from the Bardini gardens. Adult €10. Natural History Museum ("La Specola") is on Via Romana next to Pitti Palace. Open Tu-Su 09:00-16:00. 43.76777811.24361120 Santa Maria del Carmine. Famous frescoes (Masaccio’s Adam and Eve Banished From the Garden and others by Lippi and Masolino) in the Brancacci Chapel. 43.7629211.2651621 Piazzale Michelangelo (Michelangelo Square). Plaza on a hillside with a great view of the city. Go there by bus or climb the stairs and paths from the Lungarno della Zecca. 43.75944411.26522 San Miniato al Monte (uphill from Piazzale Michelangelo). The Sacristy contains frescoes by Spinello Aretino. In the cemetery near this church there are graves of famous people of Florence, including Carlo Lorenzi (Collodi) - author of the famous Pinocchio. Also, turn around when you reach the top of the stairs before entering the church, to see perhaps an even greater view of the city than from nearby Piazzale Michelangelo. Museo Stefano Bardini: collection of early Florentine art, housed in the Palazzo Mozzi just south of Ponte alla Grazia. It's open F-M 11:00-17:00. Great places to walk include along the Arno and across any of its bridges; through narrow, medieval back streets in the Santa Croce area; and in the Oltr'Arno - on the south side of the river, in many ways like Rome's Trastevere or Paris's Left Bank - but far, far smaller. Climb the Duomo or Campanile. Traverse the winding staircases inside the duomo or the nearby bell tower to see some of the best views of Florence. Not only can you see the Tuscan countryside in the distance and the impressive palaces and churches of Florence in the fore, but it also shows you just how large the Duomo is. Stroll the Boboli Gardens. These extensive gardens behind the Pitti palace provide excellent views of the city of Florence and numerous sculptures in a relaxed environment. Stop in the hilltop café, grab a drink and a seat outside and enjoy the view. Street Performers by the Uffizi, in front of the Palazzo Vecchio. In the evenings street performers often put on a show here. Performances can range from violin duets to people dressed as sculptures. A nice place to stop while you eat your after-dinner gelato. Enjoy the view from the Piazzale Michelangelo. It's a big square on a hill, but somewhat distant from the traditional tourist sites. It's easy to reach it even on foot using the stairs called "Rampe di San Niccolò". They are on the side of the Arno river just in front of the national library. Do this during the summer and during the night to admire Florence's lights. Join a monastery: those aged 18-35 are invited to take a two-day spiritual retreat at Badia Fiorentina on Via del Proconsolo. Or just come to hear sung vespers at 6 pm and mass at 6.30 pm nightly in this peaceful church, filled with artwork. It's central yet virtually free of tourists. Impruneta's spa, Via Cassia 217, Terme di Firenze (from the city of Florence, take the Autostradale Firenze - Siena and the SR2; the spa is on a lefthand turnoff from the R2, approximately 13 km south of the city of Florence). The thermal waters of Impruneta spring from two sources and are used to treat respiratory diseases, liver, gastrointestinal, and skin allergies. Florence Phography Workshop & Tour, ☎ +39 348 840 0459, e-mail: info@florenceinferno.com. 12:00-18:00 (13:30-19:30 in July and August). Discover Florence with your camera and with a professional photography teacher (a Vogue-featured American photographer) and a official Florence guide at your side. ABC School, Via dei Rustici 7, ☎ +39 055 212001, fax: +39 055 212001, e-mail: info@abcschool.com. 09:00-17:00. Italian language school offering language and cultural courses since 1982. Istituto Galilei, Via Alfani 68, ☎ +39 055 29 46 80, fax: +39 055 28 34 81, e-mail: info@galilei.it. Italian language school specializing in one-to-one, personalized and small group (max 4 people) full immersion courses. Michelangelo Institute, Via Ghibellina 88, ☎ +39 055 240975, e-mail: michelangelo@dada.it. Italian study programmes for foreign students. Cooking workshop, art history classes, plastic arts and visual arts programs are also taught in this academy. Cooking Class. Florence and Tuscany are becoming synonymous with "cooking class". Tuscan cuisine is appreciated worldwide and a cooking class experience is now more and more part of the attraction of Tuscany, as a way of carrying back home memories and improved cooking skills. There are many in the area, either in historical villas in the countryside or in central Florence, from Florentine use of tripe and giblets to the use of organic ingredients from the local producers, and classes range widely in size. During high season, make sure to book in advance. There are a few places to buy things, from the high-end jewelry stores lining the Ponte Vecchio to some of the most famous shops in the world; Gucci, Pucci, Ferragamo, Valentino, Prada, Armani, Ermenegildo Zegna, Buccellati, Frette, as well as many more wonderful shops that aren't yet world famous. Souvenirs related to art and Florence's sights can be found everywhere. Books, leather goods, art handcrafted journals, frames, pencils etc. in that gorgeous Florentine paper with swirls of color and gold are great gifts. It is increasingly difficult to find bargains, but keen-eyed shoppers can still find good deals on smaller, side streets running off of those above and elsewhere in the center of town. Better stores in/near the city center offer superb leathers at sometimes decent prices...perhaps after some bickering. Goldsmiths on the Ponte Vecchio display beautiful and quality work, but can be very expensive. Shops that are not located in the very centre of the city are significantly cheaper. There are also superb shopping streets, such as the Via Tornabuoni, the Via del Parione, and the Via Maggio. The San Lorenzo market is now largely for tourists. There are also a couple of collections of "outlets" in the suburbs. Enoteca Mondovino, Via S. Agostino 27-29/R, ☎ +39 055 215214. Decent wine and Liquor store with interesting collection of potable bitters in the back (Italian and German). Officina Profumo-Farmaceutica di Santa Maria Novella, Via della Scala 16 N. An old pharmacy, which sells high-qualitiy beauty products like soaps, shaving cream, eau de Cologne. Pitti Vintage - Italian & European Vintage Clothing & Accessories, Borgo degli Albizi 72r, ☎ +39 055 230 2676, e-mail: shopkeeper@PittiVintage.com. Fendi, Ferragamo, Gucci, Lancetti, Valentino. Specializes in Italian and European designer and one-of-a-kind vintage pieces. Cose Del 900 - Italian Glass Connection, Borgo San Jacopo 45R (Just two minutes from Ponte Vecchio. ), ☎ +39 055 283 491, e-mail: Shopkeeper@ItalianGlassConnection.com. M-Sa 10:30-19:30. Since 1981 specializing in sized-to-order, affordable beaded jewelry featuring handmade Murano glass beads. Ortigia SRL, Borgo San Jacopo 12R (next to the Ponte Vecchio), ☎ +39 055 282129. Luxurious soaps, scents, creams, candles and lotions inspired by the aesthetics, colours, and scents of Sicily. The best lunch places don't always turn out to be the best dinner places. Dinner in Florence really starts sometime between 19:00 and 21:00. If a place looks like they're preparing to close before 20:00, it might not be the best option for dinner. Reheated pasta is not very tasty. Typical Tuscan courses include Bistecca alla fiorentina which is huge t-bone steak weighing from 500g to 1,500g. It has always price given per 100g, e.g. €3.5 etto (an etto is a "hectogram" or 100 gram-ettogrammo). Crostini toscani are crostini with tuscan liver pâté. There are many gelato (Italian ice cream) stands; some connoisseurs consider the better Florentine gelato the finest in the world. Often gelato is made in the bar where you buy it. Because of this there are many exotic flavors of ice cream like watermelon, spumante or garlic. It's hard to find a gelato place open very late, so after dinner might not be an option. Near the Duomo though, there are a few places open after 22:00. Tuscany is also the wellspring of cantuccini, also called biscotti di Prato. (In Italian, the singular of biscotti is un biscotto). It's traditional to enjoy them after a meal by dipping them in Vin Santo ("Holy Wine"), a concentrated wine made from late-harvested grapes, but you can also buy bags of them in stores throughout the city and eat them however you like. Osteria Dell'Olio, Piazza dell'Olio 10r, just west of Duomo. Good food with friendly service. Gelateria dei Neri, Via dei Neri 20r. Ice cream in many flavors, some experimental, all excellent. Vivoli, ☎ +39 055 292 334. Via Isole delle Stinche, 7/R. Close to Piazza Santa Croce. Vivoli has a good gelato fruit selection, so definitely try the fragola, or strawberry. Make sure that you ask for the cream on top as well, because it adds another element to an already great dessert. La Cite. A very nice and cozy cafe/bookstore. Good prices, nice atmosphere, good books. Borgo San Frediano 20r. Enoteca Le volpi e l'Uva, ☎ +39 055 2398132. The must of the tasting wines and savory titbits. Piazza dei Rossi, 1. Paszkowski or Gilli. On the Piazza Republica, next to the hotel Savoy. The terraces on the other side of the piazza are equally pricey. Été, Via Faenza 63. A lovely little café with warm service and good local beer and wine. €3 draft beer. Cavalli Club, Piazza del Carmine, 8. Roberto Cavalli, Italian fashion designer, has one his beautiful clubs in Florence. The inside has a stage with a projector of Roberto Cavalli's fashion shows running non-stop. The upstairs can be a private lounge for parties or VIP section on certain nights. This club was the most popular on Wednesday nights, but it’s open on the weekends as well. It’s black and leopard interior fits the natural and animalistic designs Roberto Cavalli creates. Roberto and his two sons are frequently at the club so look out! All ages are appropriate and the dress attire here is rather upscale. This is not just a seasonal club so all year visitors are encouraged to go. Drinks run about €10 each. 43.770947811.26209491 Bamboo Lounge Club, Via Giuseppe Verdi, 57/R, ☎ +393394298764, e-mail: info@bambooloungeclub.com. 23:00-04:00. Bamboo Lounge Club is a great place for young adults and students to party. The music is great from European to American techno and many other worldwide DJs. Bamboo Lounge Club offers VIP tables and has two midsized bars. It is very clean and safe to be in. It is located on Via Giuseppe Verdi not far from the Duomo. Dress is a little more than casual, but not too upscale. The loud music, dancing, and exciting atmosphere gives people a chance to let loose and have fun. The club features mostly house, techno and hip hop music. Women free entrance until 01:00; men €10. Tenax, Via Pratese, 46. If you love house and electronic music this is the best club to go to. It’s a two-story club, located on the outskirts of Florence, features DJ’s from all around Europe, America, and Australia. This club also holds many concerts during the winter and summer. Many people come from all over to enjoy this clubs atmosphere. The dance floor is extremely large and is always very crowded. Be smart where you keep your bag and wallet because it’s very easy to get pick pocketed in large clubs like this. This club usually has a cover of €20 and the drinks are rather expensive, but it is a great place to experience at least once. It is very different than most of the clubs in Florence because of the multi-story building. To venture here would be best by taxi or bus. Since it is located in the outskirts of Florence walking could be difficult and not advised. There are many people who can help in directions in the Santa Maria Novella Station. Certain hotels, particularly those oriented toward business travellers offer special reduced rates during the weekend (e.g. Starhotel Michelangelo) or during slow weeks like Baglioni. Sometimes you can also get a substantial discount by reserving online. In the train station there is a tourist information office which also offers hotel reservations; you can often get good deals through them at the very last minute, but it's not guaranteed. There are quite a number of one or two star alberghi within a short distance of the station. Young women can find accommodation with certain convents at very low prices, and usually in historic locations. On the other hand, you'll have to forget about any late-night Tuscan craziness. There are campsites round the edge of town: to SW is Ostello Tasso Ente, north is Elite Firenze Gestioie SRL, NE is Camping Albergue, east is Me & Mom in Tuscany, and 3 others further east in Rovezzano. Camping Michelangelo south of town has closed. FH Calzaiuoli Hotel, via Calzaiuoli 6, ☎ +39 055 212 456, fax: +39 055 268310, e-mail: info@calzaiuoli.it. Central 4-star going on 3. B&B double from €150. 43.77161711.2529648 Palazzo Vecchietti, Via degli Strozzi, 4 50123 Firenze, ☎ +39 055 2302802, e-mail: info@palazzovecchietti.com. Historic residence a few steps from Piazza della Repubblica, in the center of Florence. Few suites, elegant and modern. The hotel also offers two apartments in the central area. Gluten-free products and breakfast included in the room rate. Since there are a large number of tourists around, the center of Florence is brimming with webcafés and telephone call centers. Most evenings there are long lines for access to the phone-booths. You can also buy a pre-paid card which will give you a steep discount on international calls by dialing a special number. Wireless LAN access is becoming popular. Even when offered for free, you will need to provide your name and contact details to the provider of the service to obtain an access code. This is because of Italian anti-terror laws. Anonymous access is not possible. Florence is generally safe and healthy, but beware the inevitable purse-snatchers and pickpockets. They thrive in crowds, particularly around SMN railway station and on the buses, sometimes working with a decoy such as an insistent beggar. If you have a bag with a classy, noiseless zipper, it will be opened. Fiesole is in the hills above Florence, only a short bus ride away from the centre. It offers a beautiful view of the sunset, and a small museum located on ancient Roman and Etruscan ruins of a temple and an amphitheater. 43.6920311.2091823 World War II Florence American Cemetery and Memorial (12 km (7.5 miles) south of Florence on the west side of Via Cassia. The Rome-Milan highway passes near the cemetery. 20 min bus ride from the Sita Station, just ask agent (get a return ticket)). Open daily except for 25 December and 1 January; 09:00-17:00. The cemetery is the final resting place for 4,402 American military dead lost during after the capture of Rome and the battle for the Apennines. A monument is inscribed with the names of 1,409 Americans whose remains were never found or identified. The atrium of the chapel contains marble maps of World War II Italy campaign. Free to enter. UNESCO World Heritage Listed rural building complexes (Medici Villas and Gardens) are scattered around Florence. This city travel guide to Florence is a usable article. It has information on how to get there and on restaurants and hotels. An adventurous person could use this article, but please feel free to improve it by editing the page.